QuickBooks 2015 offers a variety of new and improved features that make it easier for small business owners to take care of accounting. The updated version includes a number of changes that users have been asking for, including improved efficiency, customer tracking, and insights. Take a look at these quick tips for getting the most out of QuickBooks 2015, but bear in mind that features may vary based on the version of QuickBooks you are using. Get quick performance updates with the Insights Tab. QuickBooks now makes it easier to access an overview of how your company is performing, directly from the home page. The Insights tab provides real-time information on performance and allows easier sharing of vital information with your accountant. Use the Insights page to get the information you need at a glance without having to run a report, saving time and helping you to keep on top of changes. Use Enhanced Reports to save time. The enhanced reports for 2015 save you time as well as make reports easier to share, understand, and discuss. Multiple reports can be sent in a single email, and the layout of the reports is easier to read than in previous versions. Use of the new comments feature is one of the best tips for getting more from QuickBooks reports – you can now add additional thoughts, explanations, and insights right along with the reports. In addition, you can save time with the new ability to search report names via filters, which you’ll also find are now in alphabetical order for ease of use. Track unbilled hours more easily. The Income Tracker has a new feature that will allow you to keep up with unbilled hours – the new Time & Expenses section. Use this feature to see at a glance your unbilled hours and take any necessary action quickly and easily. Keep customer notes at hand. For 2015, QuickBooks has added a Notes feature that will allow you to add notes and comments regarding customers – or employees – and have them at hand whenever you need them. Notes can be pinned so that any action items are right up front and important details won’t be forgotten. Use shared folders to keep your accountant in the loop. One of the improvements for 2015 is the option to share your company file with your accountant via a simple portable file system. You can keep everything up to date and allow your accountant to easily access information as needed in one QuickBooks folder, a more streamlined approach than the previous sharing system. Updated reminders window keeps things from falling through the cracks. The reminders window is more useful than ever in the new version of QuickBooks, thanks to a cleaned-up appearance. Use this window to keep tabs on important reminders as well as notifications, including your to-do list, accountant notes, items that are overdue, and more. Keep track of billable time and costs more easily. Put this feature to greater use in the new version, thanks to an update that shows all records available as you add billable time and costs to an invoice. Thanks to this feature, you’re less likely to miss something important. 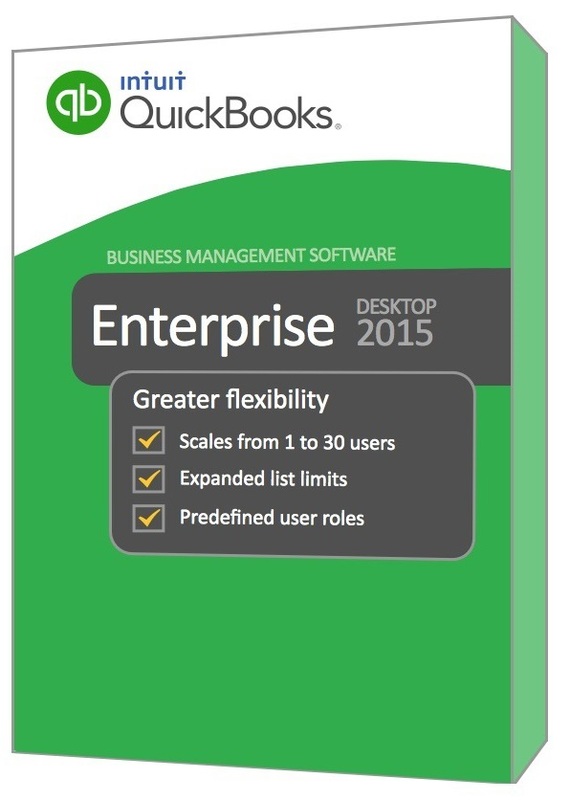 Quickbooks 2015 Enterprise Gold subscription includes all of the functionality of the Silver Edition + QuickBooks Enhanced Payroll so that you can easily pay employees, pay and file taxes. This entry was posted in Information by Jim Walker. Bookmark the permalink.